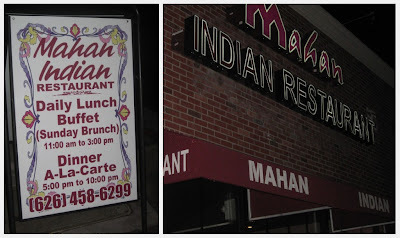 Similar to the downtown region it's in, it's hit-and-miss at Mahan -- though, if you're in the area, I'd feel comfortable recommending it for the occasional Indian dinner. The Details: Nick and his brother Bobby have regular dinners together every Sunday. Sometimes when I'm in Pasadena for the day I'm invited along. I imagine it's quite the change of pace for them -- instead of talking about sports and current events, they get to hear me babble on about food and whatever else I babble on about (sometimes I'm not even sure). On the plus side, whereas Nick and Bobby are both creatures of habit and eat at the same five or so restaurants every week, I occasionally inspire them to venture out. 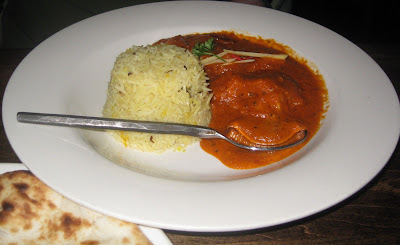 Both seem to get a kick out of helping me with my Indian restaurant reviews, so this particular Sunday it was Bobby who suggested we go to neighboring Alhambra to check out Mahan Indian Restaurant. 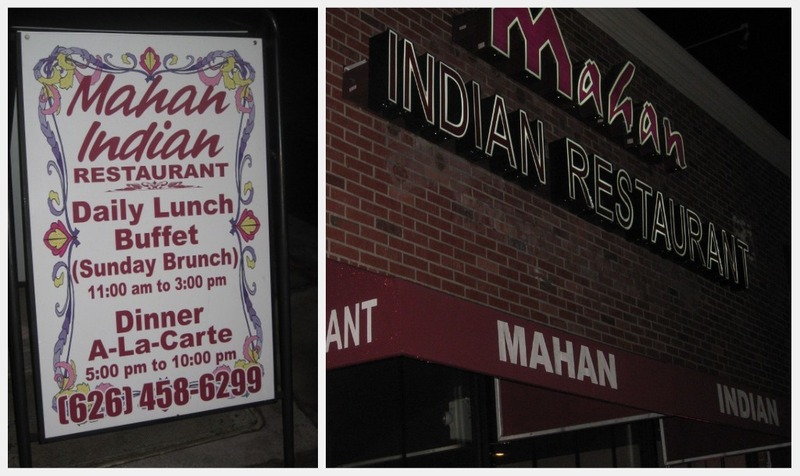 Mahan is located in downtown Alhambra, which feels like a half-empty Old Town Pasadena. 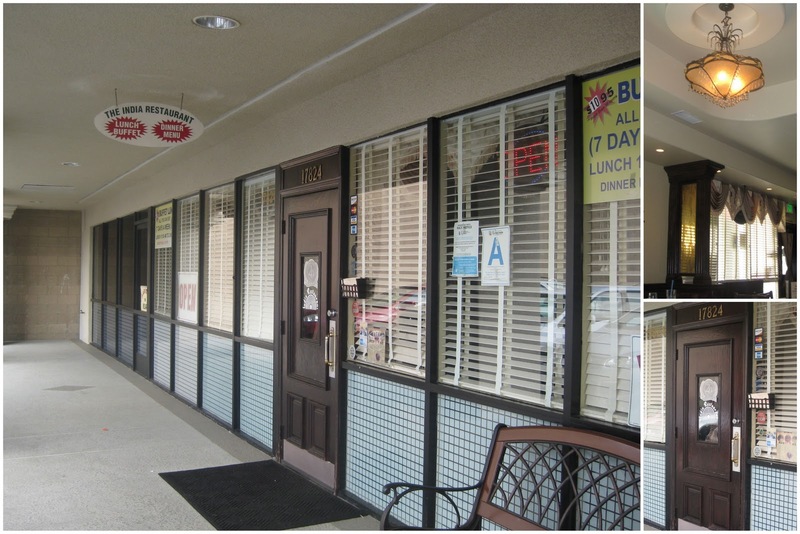 Whereas Old Town Pasadena is a bustling retail district, downtown Alhambra has some really nice blocks of retail and restaurants but then has a mostly-abandoned mall and many empty storefronts. It was a weird juxtaposition. Of course, Old Town Pasadena has experienced periods of decline too, so I'd be interested to see how downtown Alhambra fares in the next several years and wonder if it'll be able to stage a comeback. Inside Mahan, Indian music was playing, large framed Indian wall hangings were on the wall as focal points, and nice chandeliers (that didn't weren't Indian-themed though) hung from the ceiling. 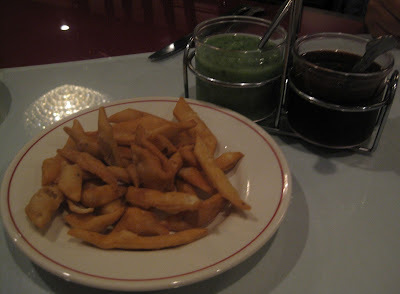 Instead of the usual free papadum (it's 2 pieces for $1 here), the restaurant offers something that I can best liken to Indian French fries. 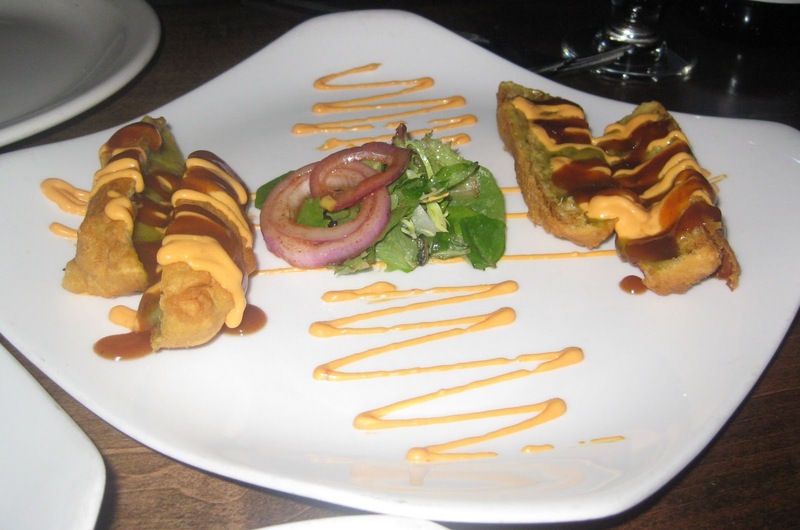 This is the first time I've seen this appetizer. 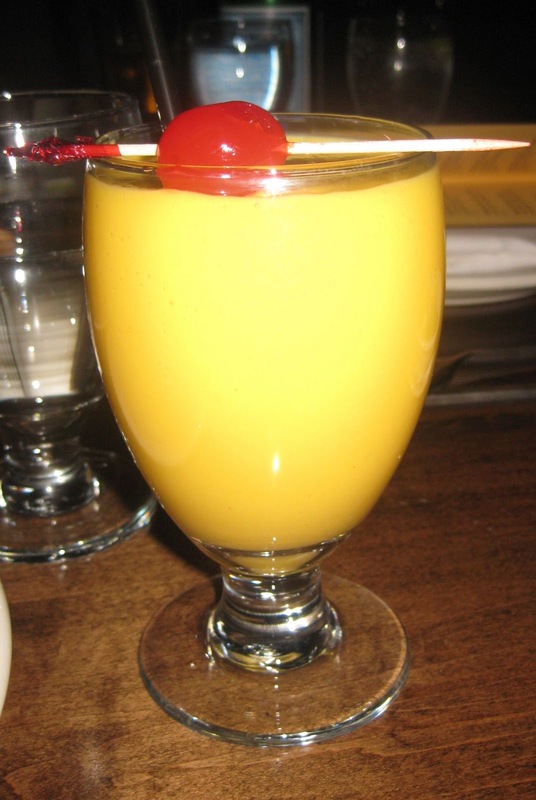 The server called it something that sounded like "Marty" but I may have that spelled totally wrong. (If you know what it is, feel free to leave me a comment.) They tasted like they were made of besan (chickpea flour). They were quite good, and it was a cool change from the typical papadum. 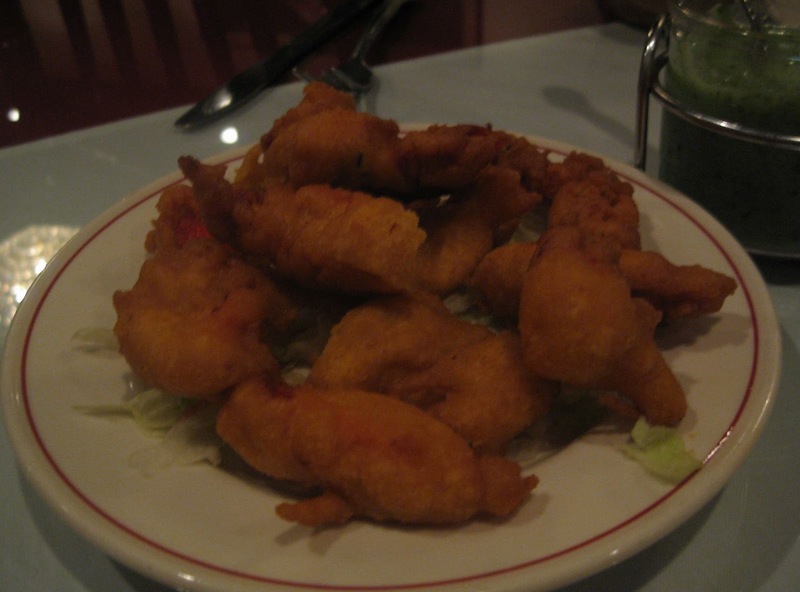 Service was definitely on the slow side (though weirdly the server was on top of refilling our water glasses, so maybe they were having some sort of kitchen issue), so much so that we'd forgotten we'd ordered Chicken Pakoras by the time this appetizer arrived. 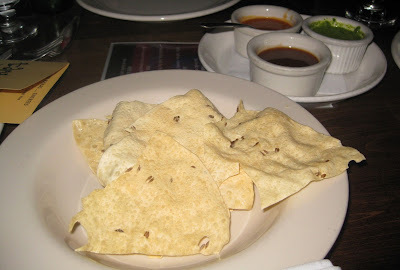 These were yummy, though a little too spicy. It made me think of an Indian take on popcorn chicken. 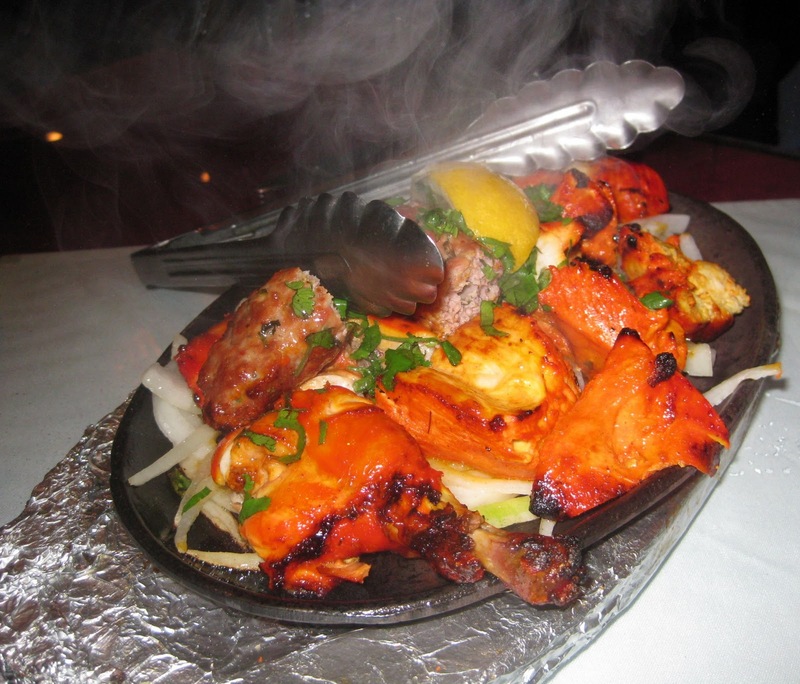 When our Mahan Mixed Grill came out, wow, it was seriously sizzling. 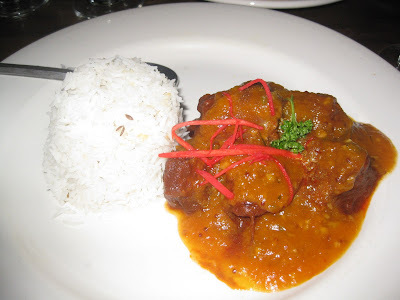 My camera even captured the sizzle coming off of this dish. 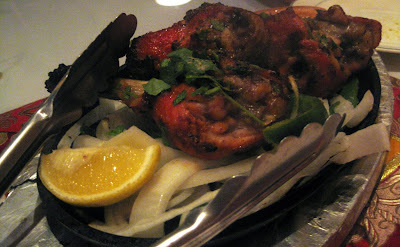 It included chicken tikka, tandoori chicken, and lamb sheekh kabob. The only bummer was the other items in our order didn't come out for quite a while afterwards. Nick wanted nothing to do with the Pumpkin Curry on the menu, but he was outvoted by Bobby and me. I.love.pumpkin. I love concocting savory pumpkin dishes like pumpkin enchiladas, mixing pumpkin puree with instant vanilla pudding and pumpkin pie spice to make an oh-so-easy dessert, and, not to forget, baking my Chai Spiced Pumpkin Pie. Unfortunately, this pumpkin curry was an ingenious idea that was poorly executed. It didn't even taste like pumpkin. 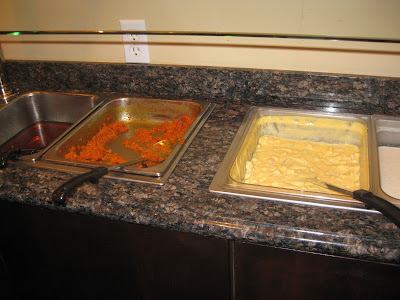 It tasted like potatoes, which it had way too many of. The only tip off that it even contained pumpkin was the orange-tinge. 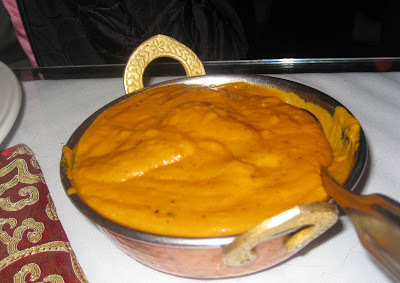 This experience made me decide that I'm going to come up with my own pumpkin curry recipe (stay tuned). I'm not a big Raita person. 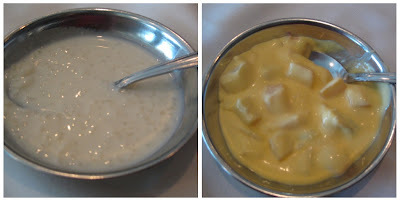 It's an Indian style yogurt, but it's typically too sour for my taste. 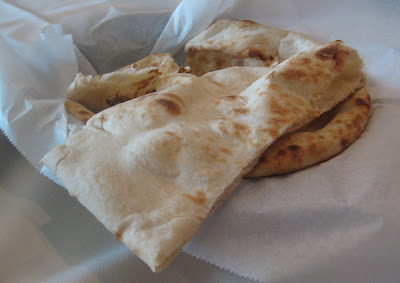 Mahan's was refreshing. I still wouldn't personally order it, but if you're a raita fan, go for it. 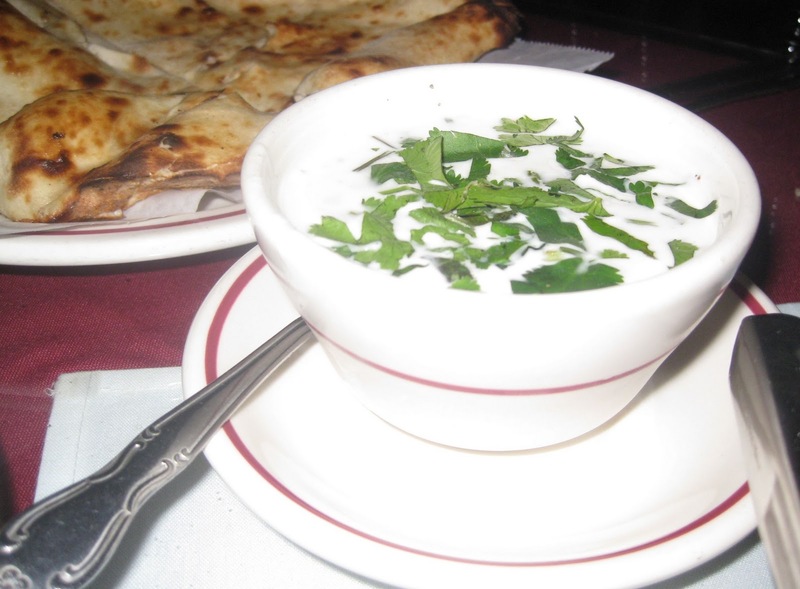 Bobby loves raita and felt the yogurt was good but would have preferred thicker cucumber pieces. 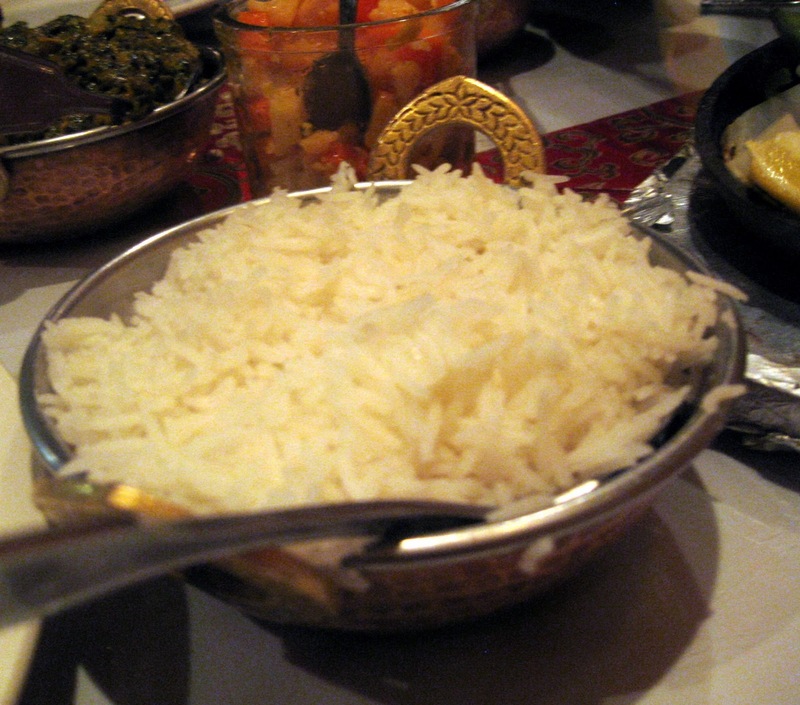 The rice here was better than usual. It had great flavor -- saffron perhaps? 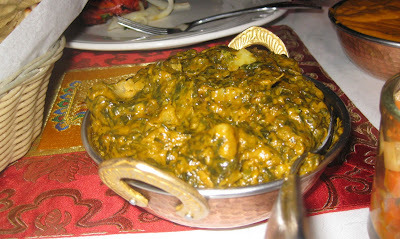 What's your favorite non-traditional curry? Mahan Indian Restaurant, 110 W Main St., Alhambra 91801. (626) 458-6299. Focusing mostly on Indian cuisine (with a few Nepalese and Tibetan options), the food at this serene Huntington Beach restaurant is delicious. The Details: Himalayan Grill enveloped me in a sense of calm. 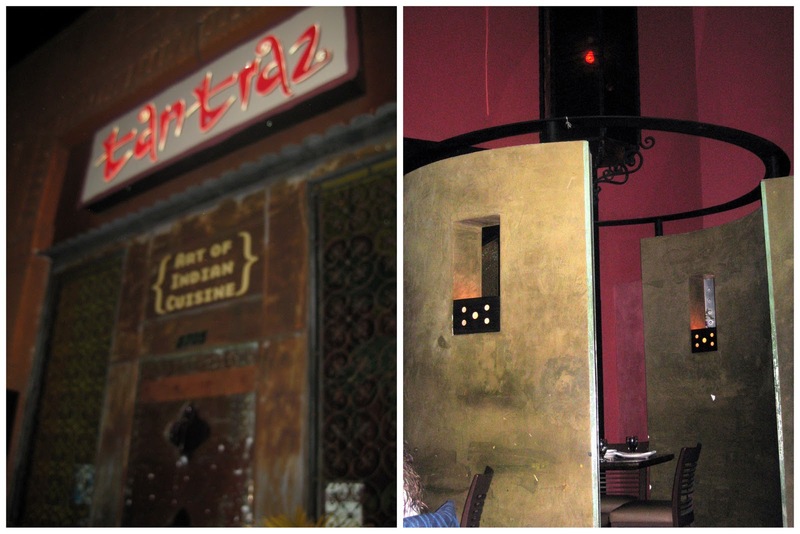 I'm not sure whether it was the water feature at the entry, the hanging Tibetan prayer flags, or the soothing music playing in the background, but I was thankful to eat here after an especially hectic day. Also calming was the fact that, perhaps courtesy of the fact that the restaurant is in Orange County, there's actually ample free parking. On this Monday night, Nick and I met up with two friends, Kiair and Neena, for dinner. 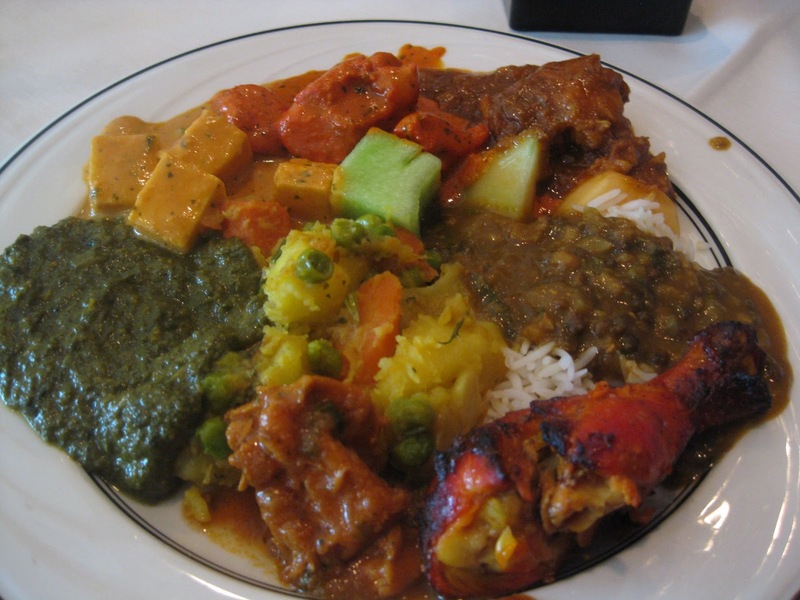 The restaurant bills itself as having food from India, Nepal, and Tibet, but the vast majority of dishes are from India. 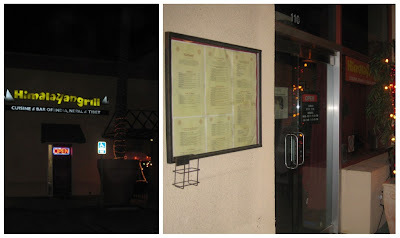 Only six entrees (all noodle dishes) are classified as Tibetan/Nepalese on the menu. 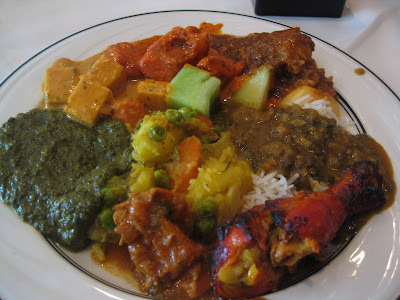 If you're looking for a place that has more dishes from Nepal and Tibet, then I'd recommend Tibet Nepal House in Pasadena instead. But if you're looking for delicious Indian food, this is definitely your place. The free Papadum came with a mango chutney, which is a nice upgrade from the usual mint or tamarind sauces. 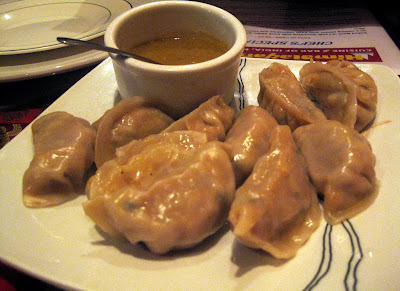 There is one Nepalese appetizer available and, lucky for Nick, it is his favorite: Meat Momos. These are steamed dumplings filled with ground chicken and mixed vegetables. They were yummy but I must warn you, they had a kick. 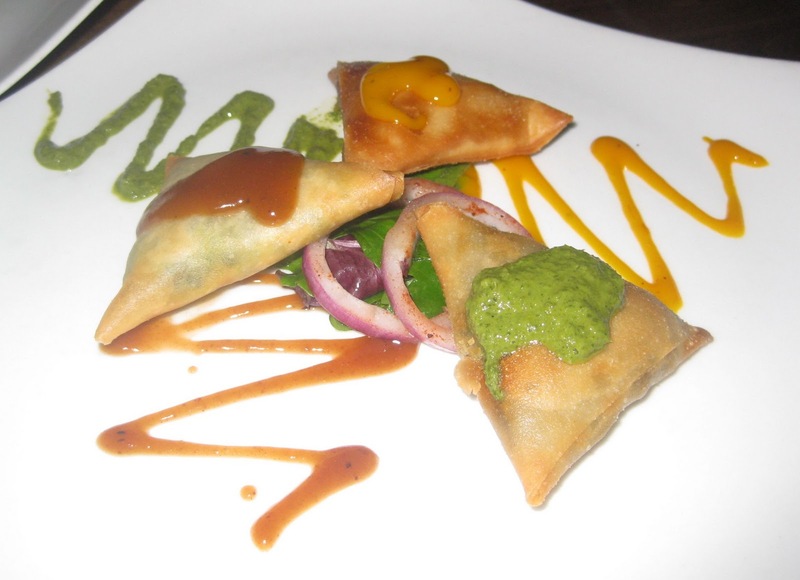 These momos are spicier than they usually would be at other restaurants. Entrees here are served family style, and the four of us shared them. 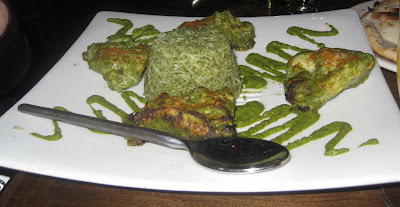 First out was the Tandoori Chicken, which was literally sizzling. As I've mentioned before, I use tandoori chicken as a barometer for Indian restaurants, and in this case, the meat was perfectly juicy. My only critique would be that I could have done without all the cilantro. Neena said she could have done without so much salt. 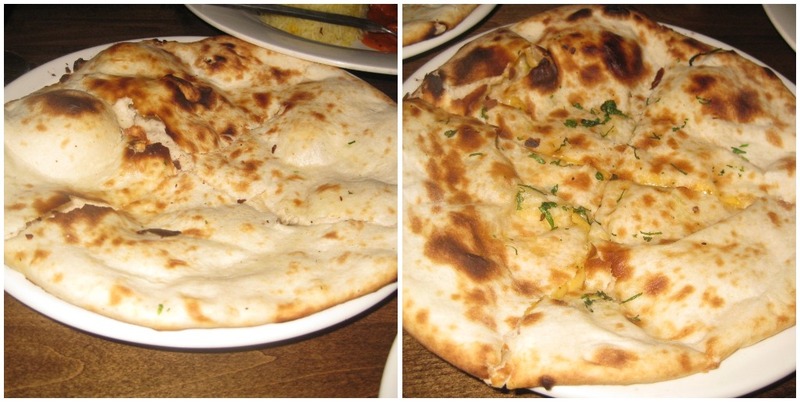 Nirvana Chicken is my exciting new Indian food discovery. 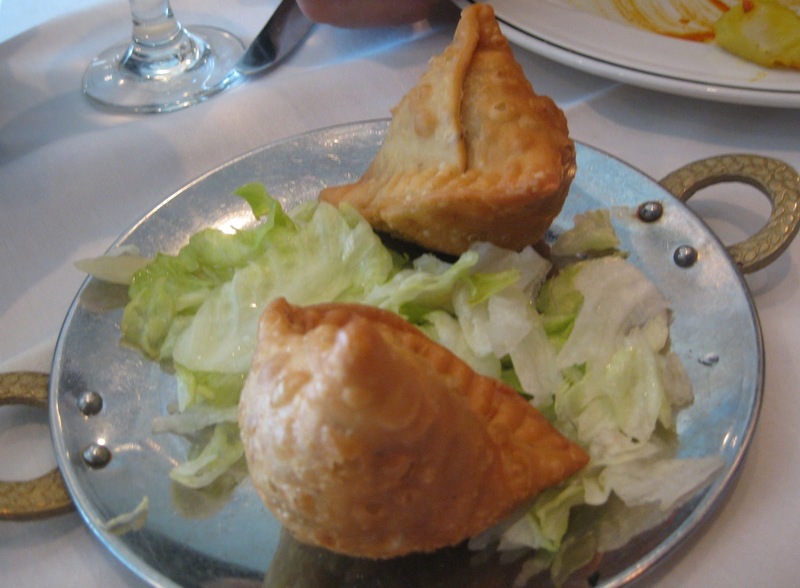 (Maybe it's weird that I'm still discovering new Indian dishes after 28 years? Still, I am thankful for this find.) It reminds us of chicken tikka masala, but with coconut flavor. 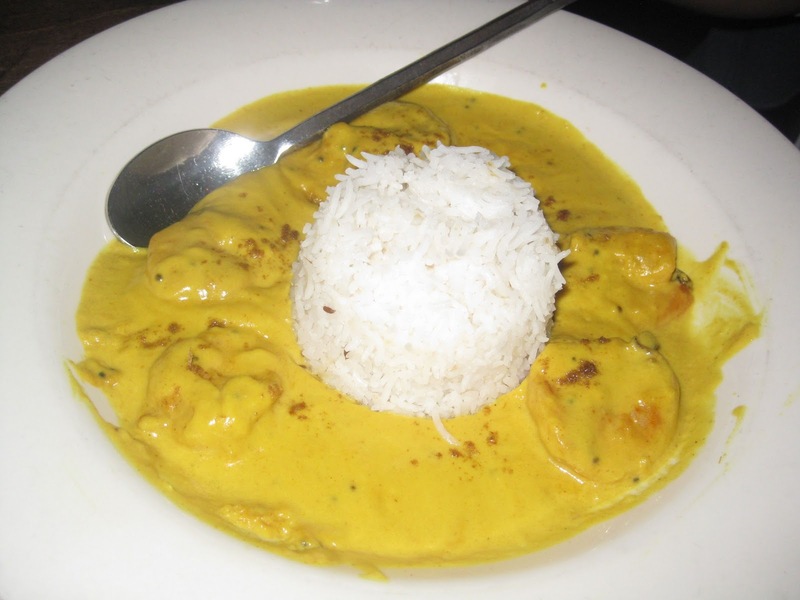 It's described on the menu as as boneless chicken tikka marinated in spice and yogurt and cooked with coconut and cream sauce. Everyone loves this sauce. 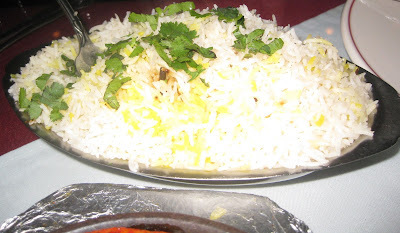 Rice had to be ordered separately, so we ordered the staple Basmati Rice to share. It's $2.95. The restaurant also offers biryanis (saffron-flavored rice dishes that have bits of veggies and/or meat or seafood thrown in; it's like the Indian answer to Chinese fried rice), starting at $11.95. 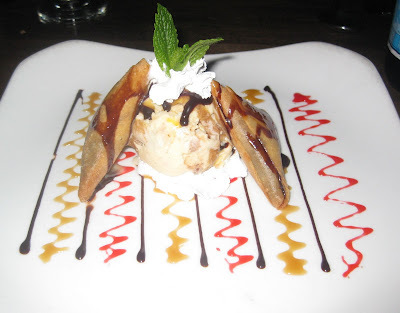 All in all, the food here is exceptionally great. Nick and I had gone here once before about two years ago, before I had this blog, and the food this time was even better than I remembered. 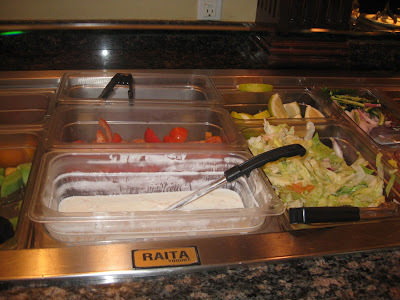 I took off a pepper for the service (slow) and because the bathroom is far (aggravating -- it's a shared bathroom with neighboring businesses, so you have to leave the restaurant to wash your hands). 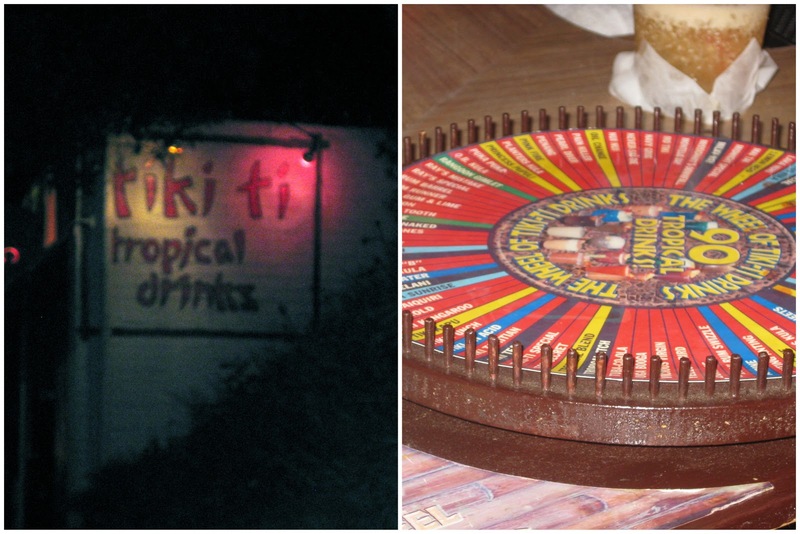 Oh, and according to the restaurant's website, there's another branch of this restaurant -- in Flagstaff, Ariz. So, if you somehow found this blog and you're in Flagstaff, please do leave a comment below to let us know if the Arizona restaurant is just as good! 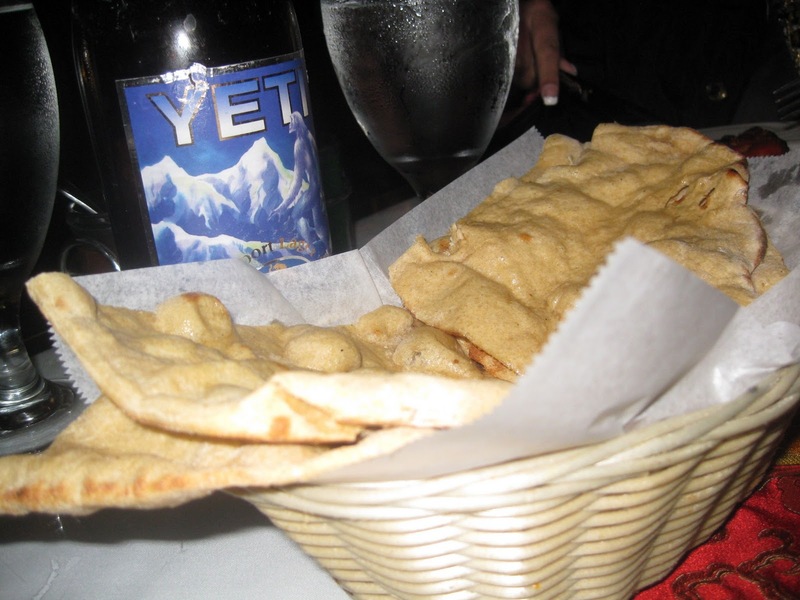 What's your favorite restaurant for Nepalese and Tibetan food? Himalayan Grill, 16400 Pacific Coast Hwy., #110, Huntington Beach 92649. (562) 592-9080. Mustard seeds add zing to this Indian seafood entree. 1. Dice the jalapeno and the garlic clove. 2. 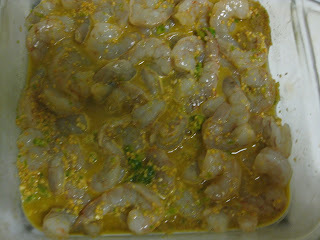 Spray the baking dish with nonstick spray and pour the shrimp into it. 3. 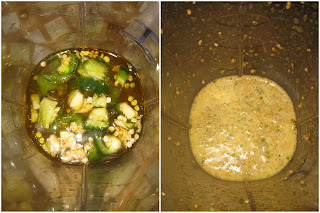 Blend together the diced jalapeno, garlic, mustard seed, salt, chili powder, turmeric, olive oil and water for about 5 to 10 seconds or until it looks like the photo on the right. 4. 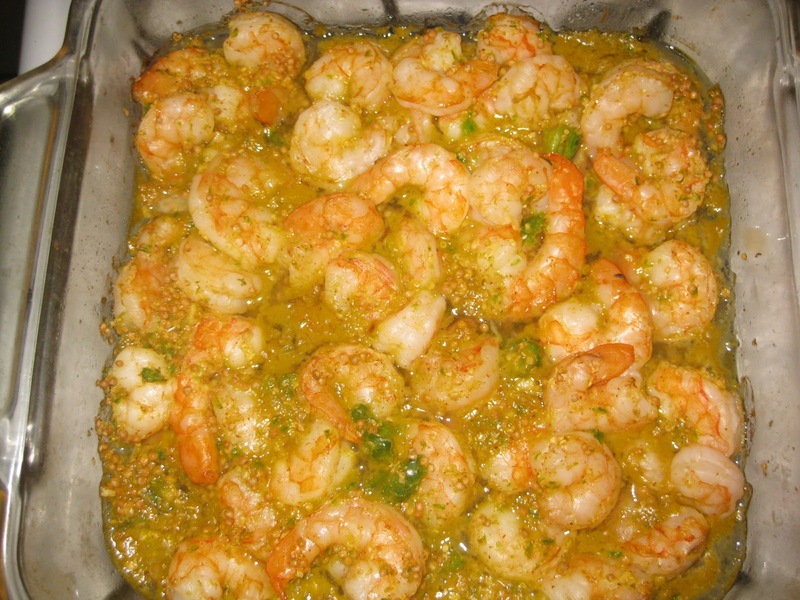 Pour this liquid over the shrimp in the dish. Refrigerate for half an hour. 5. Preheat the oven to 375°F, then bake the shrimp for 20 minutes. 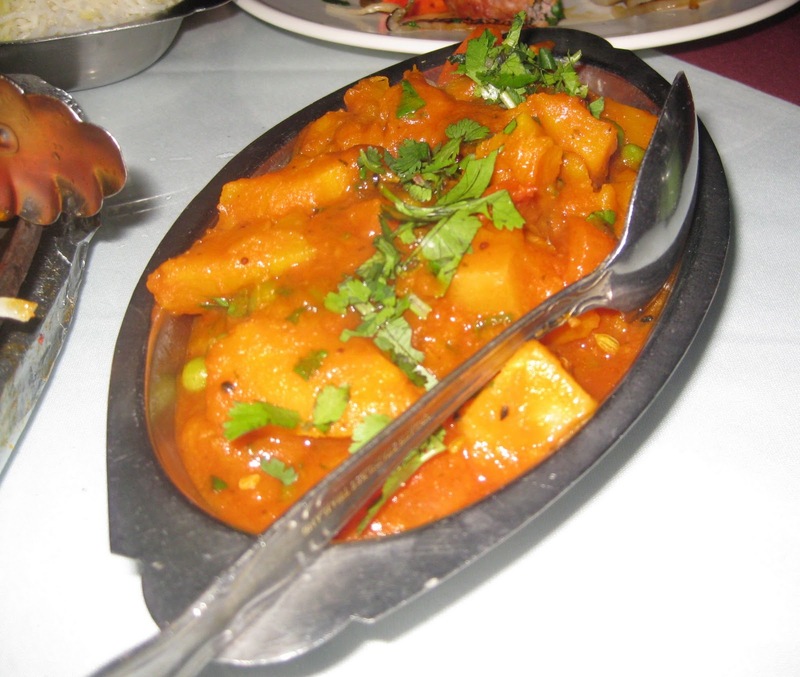 The AHH Factor: Mustard is a spice commonly found in Bengali cuisine, especially in seafood dishes. 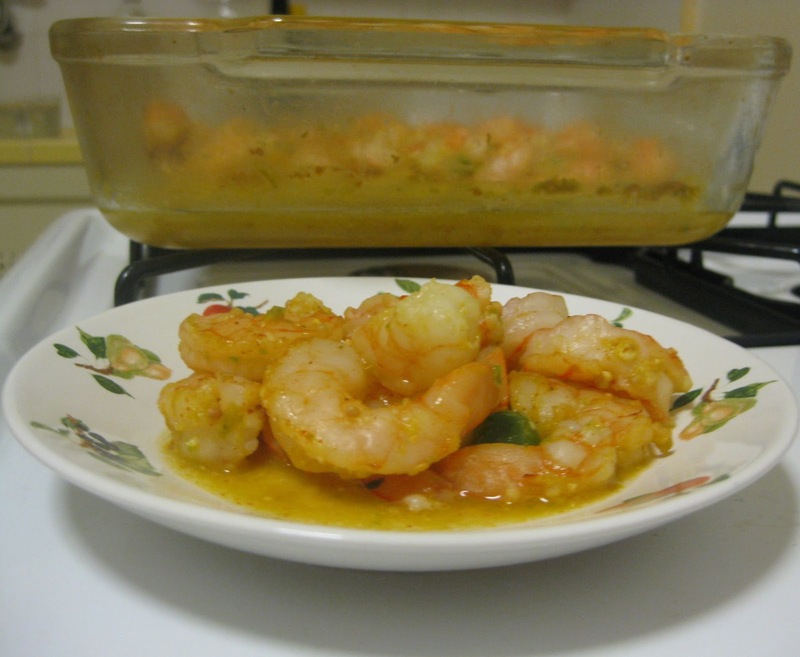 This particular recipe is adapted from my Uncle Anuj's recipe via my cousin Annie. (I call virtually every Indian man who's more than a few years older than me "uncle" and every even distant relative my "cousin," but in this case it's literally my uncle and my cousin.) Annie's dad periodically sends her Indian recipes via e-mail; I hope more of these get forwarded to me! I made a few small tweaks to my uncle's recipe, including lowering the number of jalapenos from two to one. My uncle has one of the highest spice tolerances I know; it's as if in lieu of building up their alcohol tolerances young Indian adults chug habaneros. 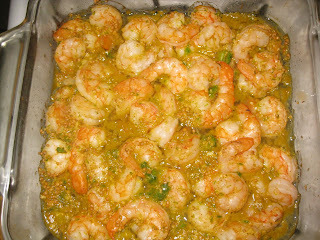 Jalapenos, though, are a mild pepper, so after tasting this recipe, I think I would have been OK with the original two. Also, I normally go to great lengths to avoid using my blender (my kitchen is short on outlets, so I have to rearrange things to plug it in), but I broke it out for this recipe as I didn't want globs of spice in my shrimp. 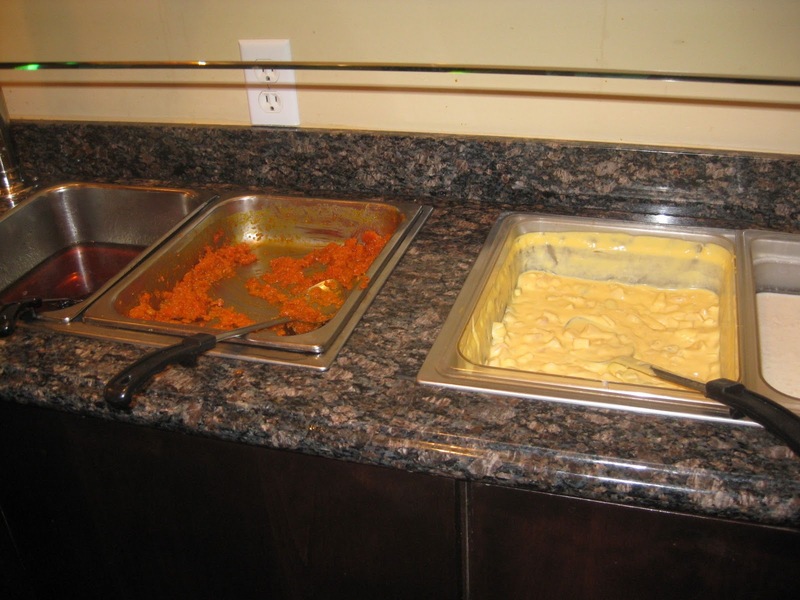 Mustard-based entrees may be an acquired taste. 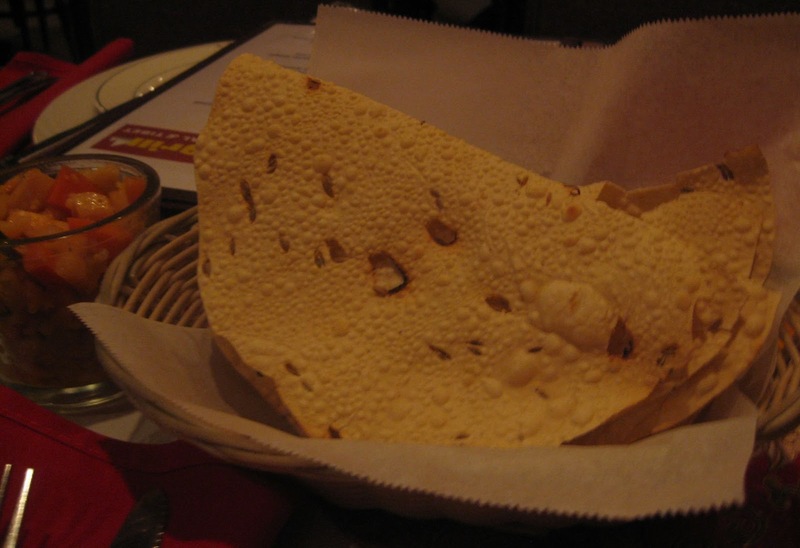 Have you ever had one at an Indian restaurant? What did you think?